Ocean urea fertilization is one geoengineering proposal aimed at not only reducing the atmospheric levels of carbon dioxide but also increasing fish populations in nutrient poor areas of the ocean. Theoretically ocean fertilization promises great benefits but there is also the possibility of serious environmental damage to consider. The nature of ocean urea fertilization means it is more likely to be carried out in coastal waters, providing States with different powers to enforce their laws compared to ocean iron fertilization which is more suitable to waters beyond national jurisdiction. 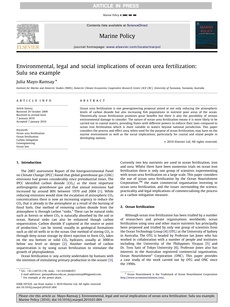 This paper considers the process and effect urea, when used for the purpose of ocean fertilization, may have on the marine environment as well as the social implications, particularly for coastal and island people in developing nations.